First of all, I have no idea how much this stuff costs or if you can even find it where you live. If you can understand THIS then let me know if it offers any information. Again, no time to say much else today. 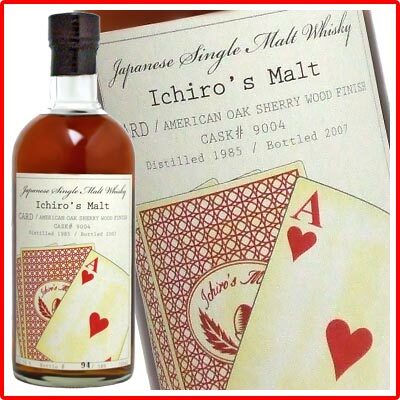 See Malt Mission #105 for another whisky from Ichiro's card series or Takeshi Mogi's site for info on Hanyu. For other posts on Japanese whiskies click HERE. This ends three weeks of international whiskies on the Malt Mission and the mission will be active but irregular over the next three weeks. Thanks for reading and have a Happy Merry everything. The aromas seem to slide down the nose, you get hit up high and the senses seem to slide their figurative fingers down the edge of the blade-of-steel aromas. Poppadoms, pickle, ginger and sherry. Some smoke, mint, fudge and lager. Complex and busy, like some new flavour of bubblegum wrestling your senses as you wonder, "what is this?" Water opens up a flower shop with dozens perfume-wearing yummy-mummies and a smoke saturated stroller. Evocative, to say the least. Eruption! Panama! Jump! Ladies and Gentlemen, it's Van Halen whisky!!! Gummi bears, boiling brown rice, fennel, wax candles, flowers and perfume all before the explosion of the abv%. Oak, sherry, cheap advent calendar chocolate, hops, smoker's fingers, all ending in sugar, soot and wet wood. Fun and rockin', this stuff is guaranteed to exhilarate. At around £150 a bottle and packing an exhilarating punch, this stuff is the 1980s poolside-cocaine-party of malt whisky. Dance the night away. Nice to read your blog. Keep posting. Although I don't have the time, opportunity and money to try them all myself, I still enjoy reading your own stories. For a (very simple and incomplete) translation you can try http://babelfish.altavista.com for instance. This at least gives me a price of 18800 yen, around 82 british pounds at the moment. Dance the Night Away is a pretty wicked tune for the time. Come on, you all love it!